Soil with poor load-bearing capacity can give way under the weight of a house. To solve settlement problems, steel push piers are "pushed", or driven, until they reach more stable soil. At Frontier Basement Systems, we recommend foundation push piers to stabilize foundations that are settling or sinking and showing symptoms such as cracked foundation walls, tilting chimneys, and jamming doors and windows. We serve Clarksville, Nashville, Jackson, Owensboro, Murfreesboro, Bowling Green, Philpot, Utica, Fayetteville, Marion, Franklin, Leitchfield, Paducah, Mcminnville, Hartford, Antioch, Shelbyville and many nearby areas in Tennessee and Kentucky. The Supportworks Push Pier System that we use here at Frontier Basement Systems features a patent-pending external sleeve which strengthens the pier system directly below the bracket, which is the most critical location. As a trusted Supportworks member, we offer professional installations of push pier systems for structures that are experiencing damage from settlement or sinking. 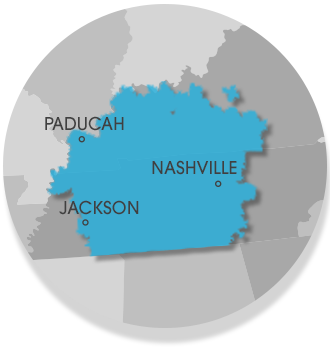 Our service area includes Jackson, Nashville, Clarksville, and nearby areas such as Bowling Green, Murfreesboro, Owensboro, Utica, Fayetteville, Marion, Philpot.